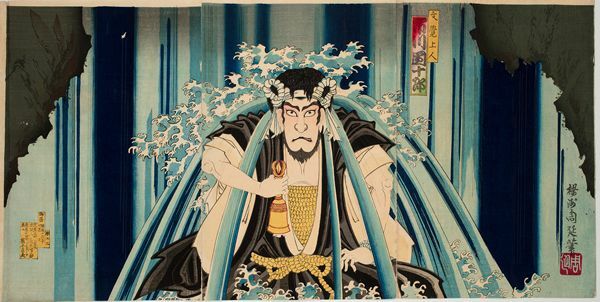 Toyohara Chikanobu (1838 - 1912)- Ichikawa Danjuro IX as Mongaku Shonin Doing Penance Under theWaterfall. 1883. Oban triptych. 71.9 x 36.5 cm. Fine impression, colour and condition with the 3 sheets attached. Oban. Fine, early impression with oxidation, burnishing and extensive application of mica on heavy, deluxe paper. Fine colour and condition. Circa 1786 1788. Hosoban. 32.8 x 14.2 cm. Fine impression, colour and condition. We have not been able to locate another impression of this design. 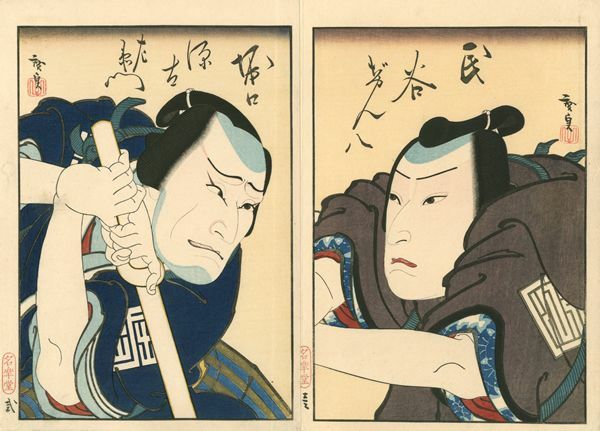 Konishi Hirosada (1819-1865)- Konishi Ebizo V as Ono no Imoko and Jitsukawa Ensaburo as Hata noKawakatsu. From the playShitennoji Garan Kagami. 1849. Chuban diptych. 25.7 x 38.1 cm. 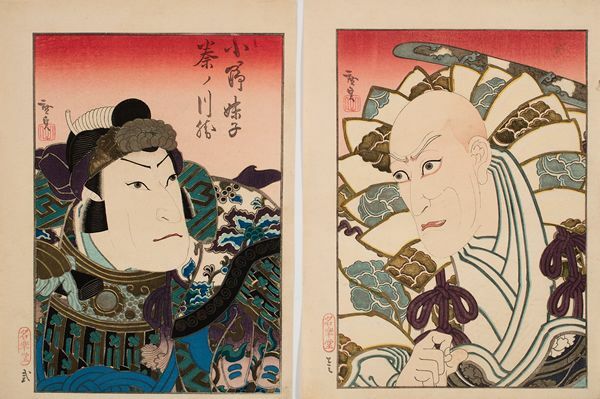 Extremely fine, early impression with extensive metallic printing and extraordinary gauffrage. This is unusual amongst Osaka chuban prints in that they have never been bound in an album and thus have never been backed or trimmed. 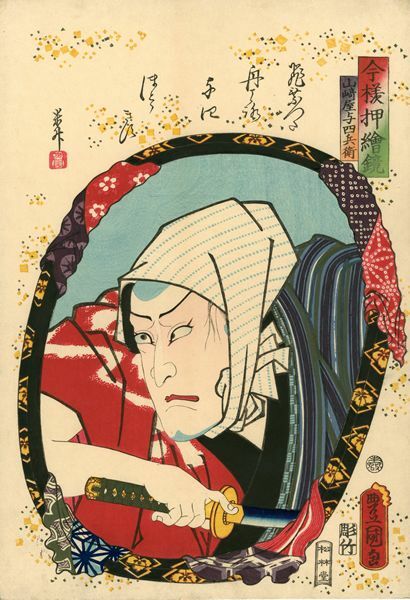 Utagawa Kunisada (1786-1864)- Nakamura Shikan IV as Kobayashi no Asahina. 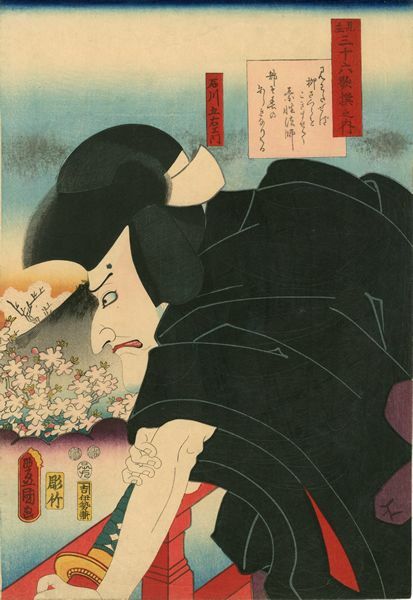 From the series Toseimitate sanjurokkasen (Modern Parallels of Thirty-six Flowers). 1862. Oban. 38.6 x 26.3 cm. Fine, early impression of the first edition with strong wood-grain and embossing on thick, deluxe paper. Fine colour. Very good condition. 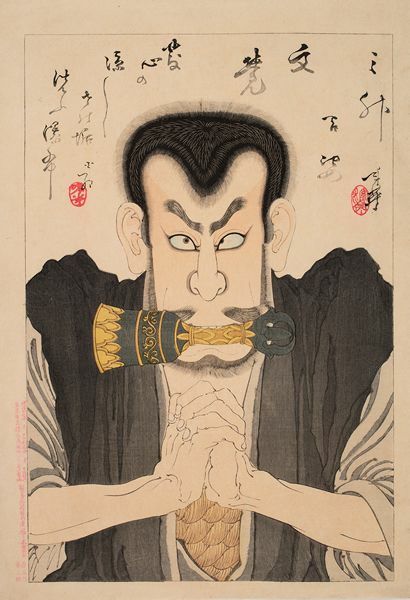 Migita Toshihide (1863-1925)- Ichikawa Danjuro IX as Mongaku Shonin. 1893. Oban. 36.7 x 25.3 cm. Fine impression and colour. Very good condition. 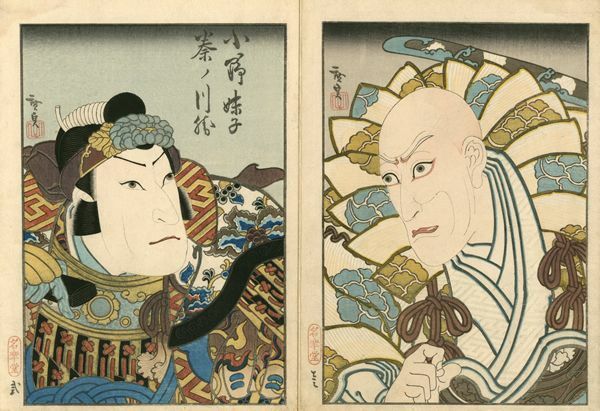 Utagawa Kunisada and Utagawa Hiroshige II ((1786-1864) & (1826-1869))- Takeda Katsuyori at Koshuya. 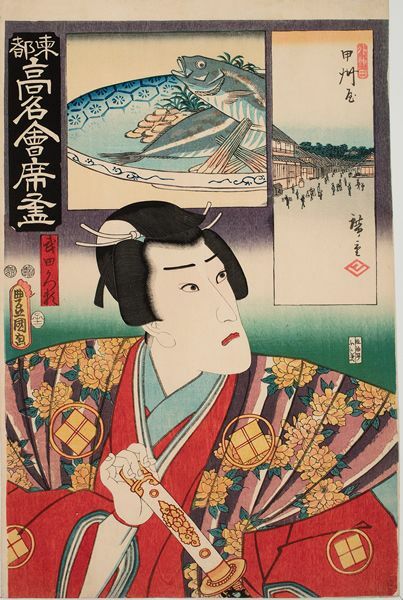 From the series Edo komei kaitei zukushi(Famous Restaurants in the Eastern Capital). 1852. Oban. 38.6 x 25.5 cm. Hiroshige: The Collected Edo Landscape Prints, no. 45. Extremely fine, early impression on thick paper with embossing, over-printing and burnishing. Brilliant colour. Fine condition. 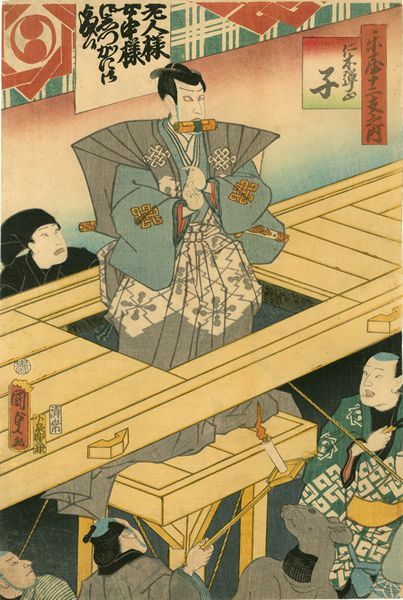 Utagawa Kunisada (1786-1864)- Iwai Hanshiro VII as Takao. 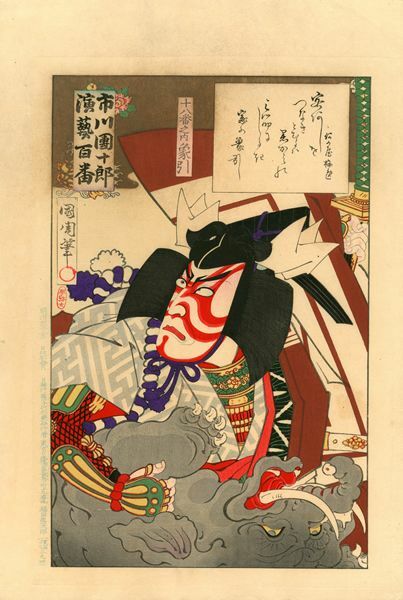 From the series Mitate sanjurokkasen no uchi (An ImaginaryThirty-six Poets). 1852. Oban. Fine impression with extensive blind-printing on deluxe paper. Fine colour. Very good condition. 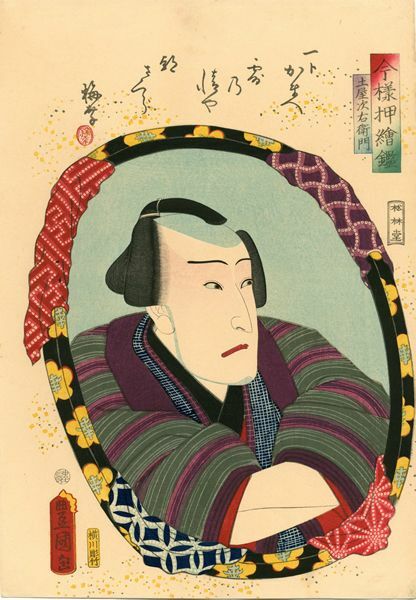 Utagawa Kunisada (1786-1864)- Nakamura Nakazo I as Sekibei. From the series Mitate sanjurokkasen no uchi (An Imaginary Thirty-six Poets). 1852. Fine impression on deluxe paper. Fine colour. Very good condition. 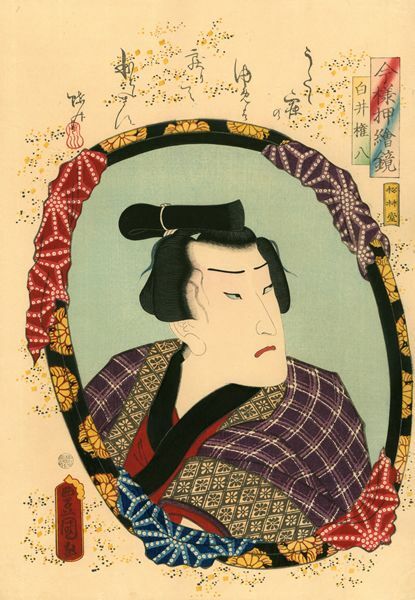 Katsukawa Shunko - Nakamura Nakazo. Circa 1780. Hosoban. Fine impression with atmospheric oxidation. Very good colour and condition. 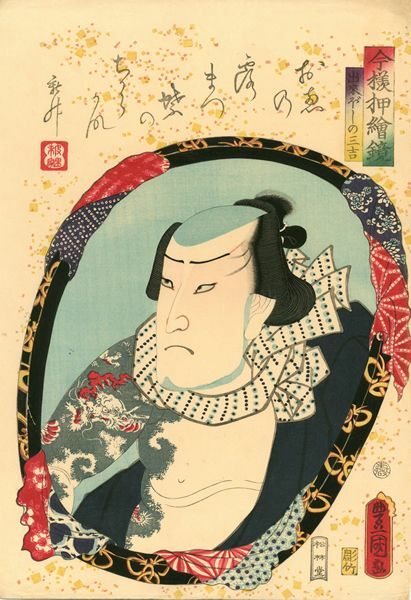 Utagawa Kunisada (1786-1864)- Bust Portrait of the Edo hero, Kanto Koroku. From a series showing backgrounds of unusual textile designs. Mid 1840. Oban. Izzard, Kunisadas World, 17/3. Fine impression, colour and condition. 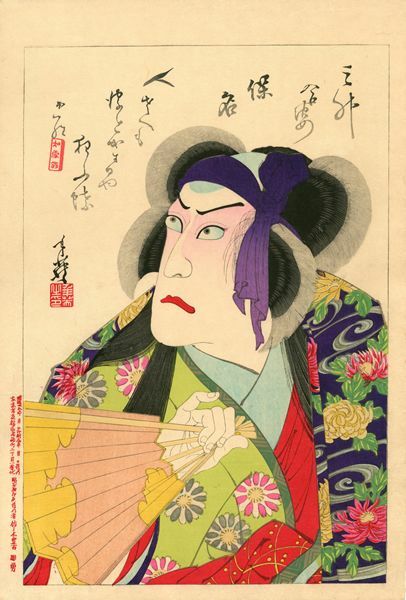 Utagawa Kunisada (1786-1864)- Nakamura Nakazo II as Toneri Matsuomaru. From the series Mitate sanjurokkasen no uchi (An Imaginary Thirty-six Poets). 1852. Oban. Fine impression with overprinting on deluxe paper. Fine colour. Very good condition. 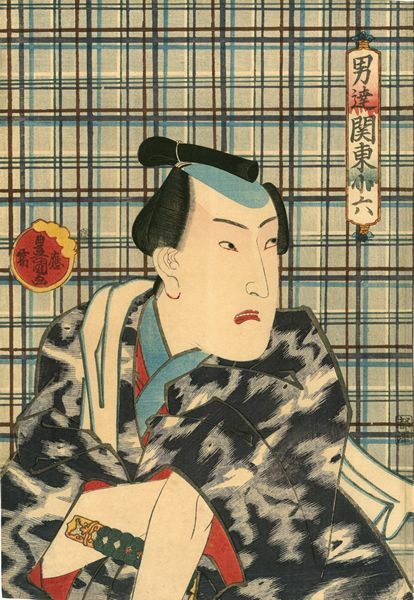 Migita Toshihide (1863-1925)- Ichikawa Danjuro IX as Soga goro. From the play Yanone. 1893. Oban. Fine impression and colour. Album backing. Very good condition. Circa 1770. Hosoban. Fine impression, colour and condition. 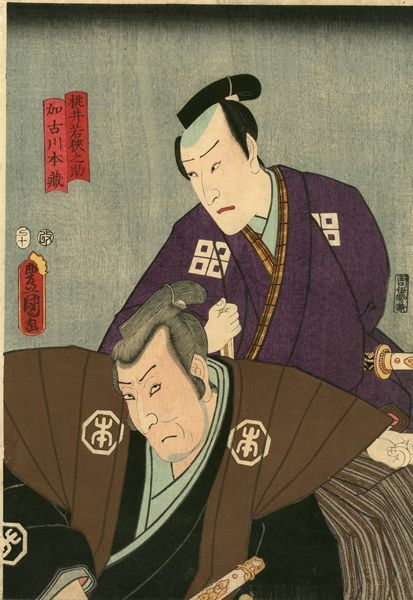 Utagawa Kunisada (1786-1864)- Onoe Kikugoro IV as Karukaya Doshin parting from his son, Ishidomaru (Played by Ichimura Uzaemon XIII) and Kawarasaki Gonjuro I as Yamazakiya Yogoro. 1856. Fan print. Provenance: Paul F. Walter. Fine impression, colour and condition. 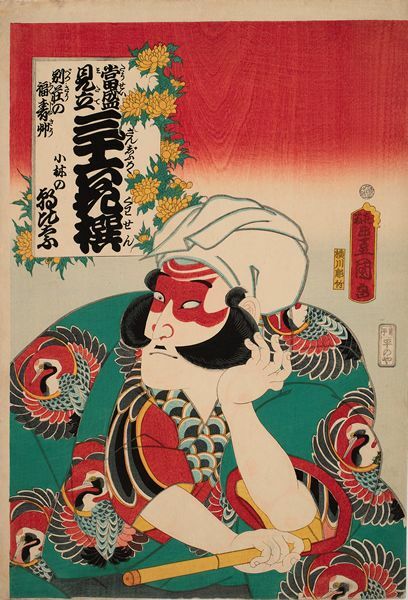 Utagawa Kunisada II (1823-1880)- Kawaraski Gonjuro I in the role of Nikki Danjo. Rat. 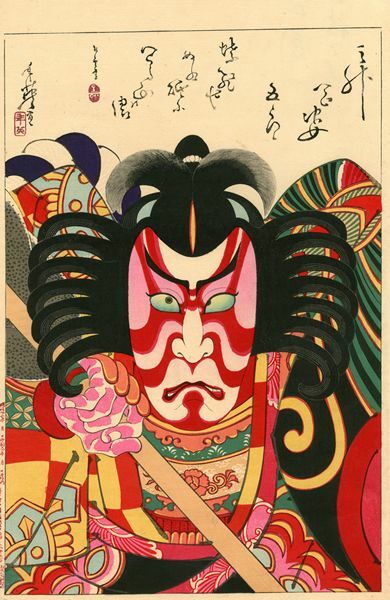 From the series Gakuya junishi no uchi (Twelve Signs of the Zodiac in the Dressing Room). 1860. Oban. Fine impression. Very good colour and condition.The print is highly unusual in showing the mechanics of the ascent of Nikki Danjo onto the theatre stage. 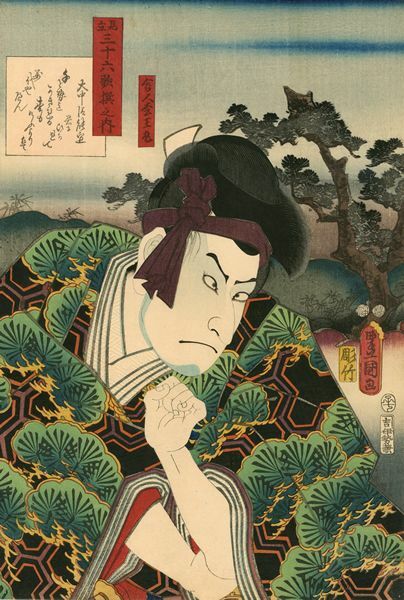 Utagawa Kunisada (1786-1864)- Onoe Baiko III as Kumagainyobo Sagami. From the series Mitate sanjurokkasen no uchi (An Imaginary Thirty-six Poets). 1852. Oban. Fine, early impression with burnishing on deluxe paper. Fine colour and condition. 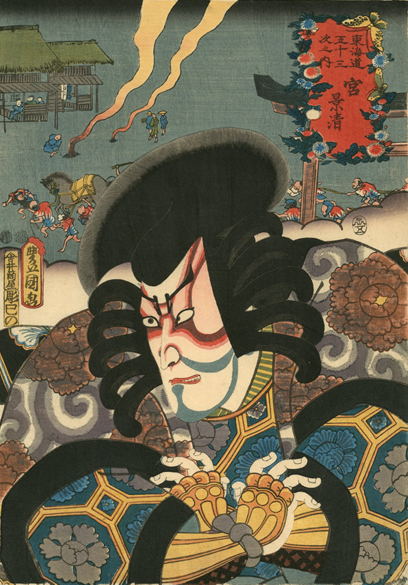 Utagawa Kunisada (1786-1864)- Arashi Koroku III as Taka Moronao. From the series Mitate sanjurokkasen no uchi (An Imaginary Thirty-six Poets). 1852. Oban. Fine impression with extensive burnishing on deluxe paper. Fine colour. Very good condition. 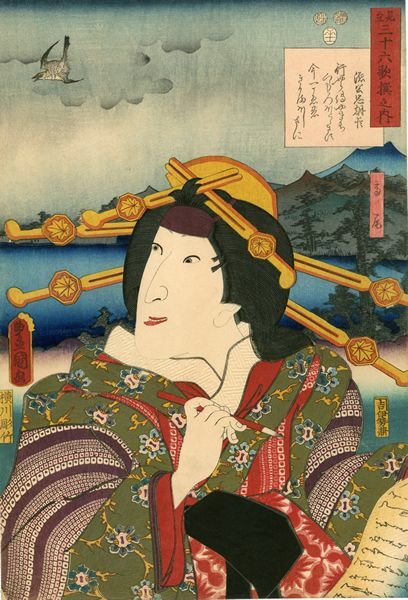 Utagawa Kunisada (1786-1864)- Bando Mitsugoro III as Shunkan sozu. From the series Mitate sanjurokkasen no uchi (An Imaginary Thirty-six Poets). 1852. Oban. Fine impression with over-printing on deluxe paper. Fine colour. Very good condition. 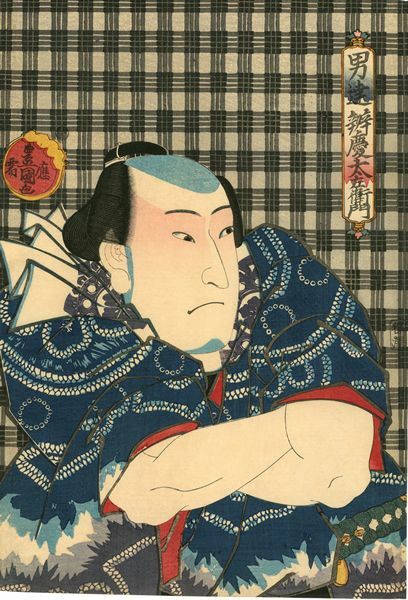 Utagawa Kunisada (1786-1864)- Bust Portrait of the Edo hero, Benkei Tanzaemon. 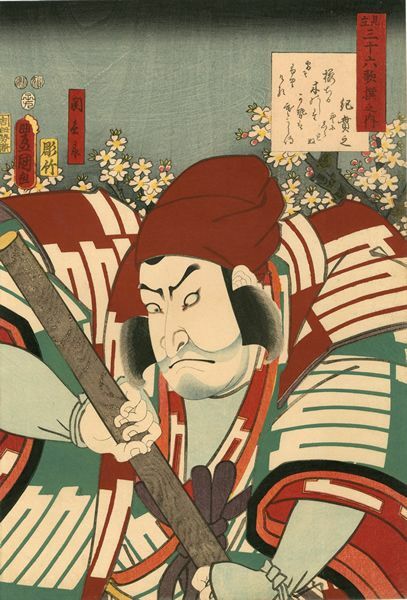 Otokodate Benkei Tazaemon. From a series showing backgrounds of unusual textile designs. Mid 1840. Oban. Fine impression, colour and condition. 1848. Chuban. Fine, early impression with extensive blind-printing. Fine colour. Pristine condition. Unusually, the print was never in an album and is thus untrimmed and unbacked. 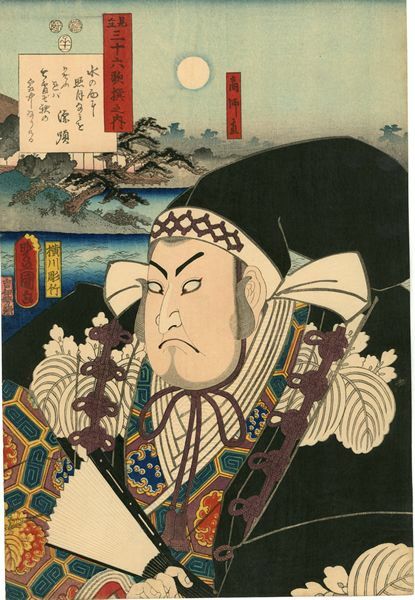 Konishi Hirosada (1819-1865)- Onoe Kikugoro III as the Ascetic Priest Nakasaina and Ichikawa Ebizo V as Nippon Daemon. 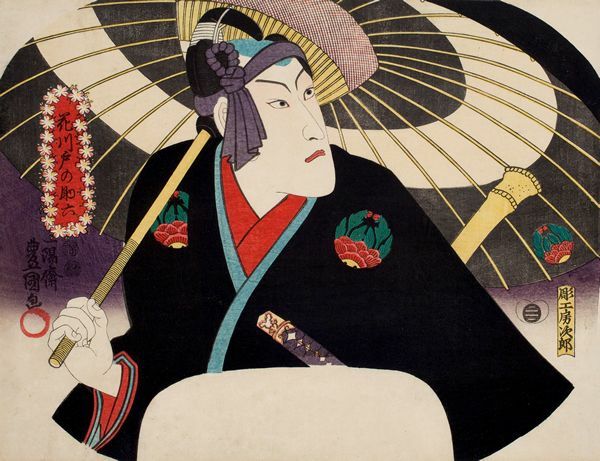 From the play Totaikeki shirashi banashi. 1848. Chuban diptych. 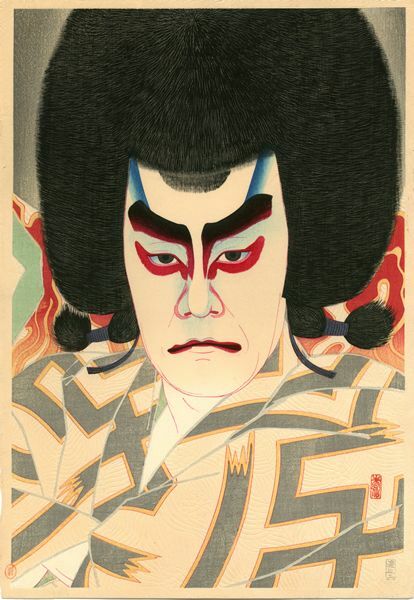 Keyes, Hirosada: Osaka Printmaker, no. 21b. Fine impression, colour and condition. 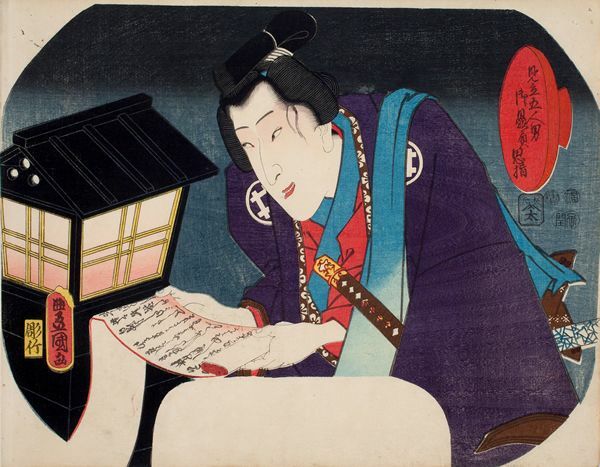 Utagawa Kunisada (1786-1864)- Bando Shuka I as Shirai Gonpachi Reading a Letter by the Light of a Lantern. From the series Mitate gonin otoko, go-hiiki no omoizashi (A Parody of the Five Chivalrous Commoners; a Cup of Sake From Their Fans). 1852. Fan print. 23.3 x 29.7cm. Fine impression with strong woodgrain. Fine colour and condition. 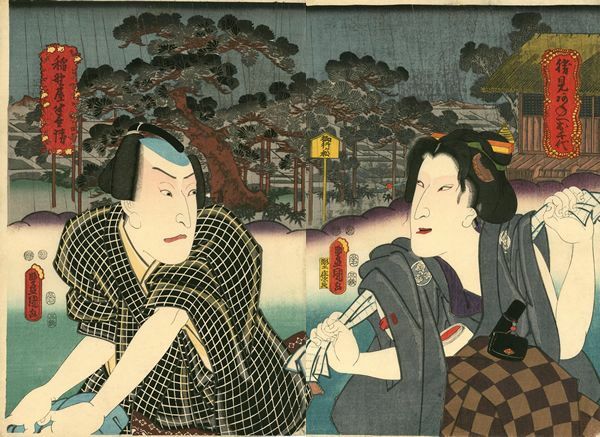 According to Paul Griffith, the term omoizashi refers to the act of pouring a cup of sake for one's chosen partner, here giving an impression of intimacy and affection between famous actors and their patrons. 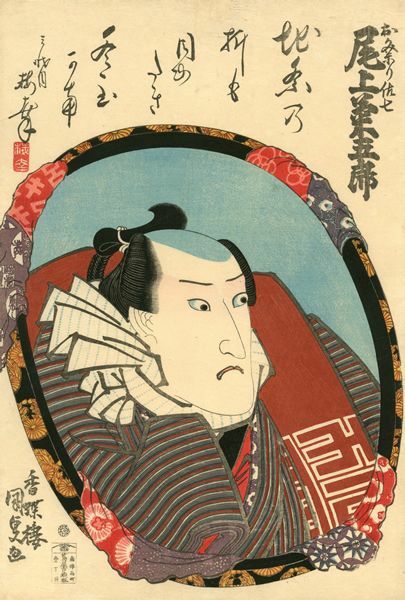 Utagawa Kunisada (1786-1864)- Ichikawa Danjuro VIII as Hanakawado Sukeroku. 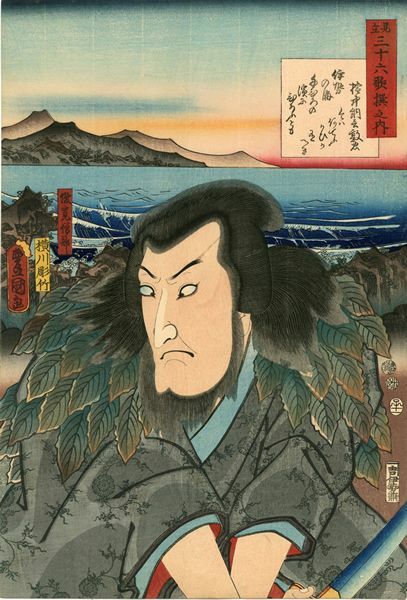 From the play Sukeroku kuruwa no hanamidoki. 1850. Fan print. 23 x 30cm. Fine impression, colour and condition. 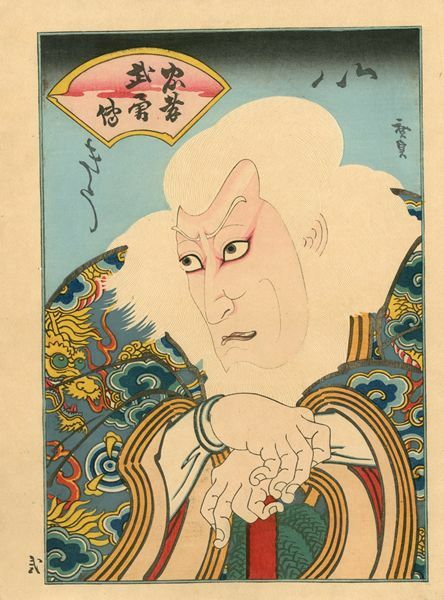 Utagawa Kunisada (1786-1864)- Onoe Baiko (Jitsukawa Enjaku I) as Tsuchiya Jiemon. From the series Imayo oshie kagami (A Mirror of Fashionable Reflections). 1860. Oban. Extremely fine, early impression on thick, deluxe paper. Fine colour and condition. 1849. Chuban diptych. Keyes, Hirosada, Osaka Printmaker, no. 16. Fine impression with metallic printing. Fine colour. Album backing. Slight restored wormage. Very good condition. 1849. Chuban triptych. Fine impression with extensive metallic printing and embossing. Very good colour and condition. Album backing. 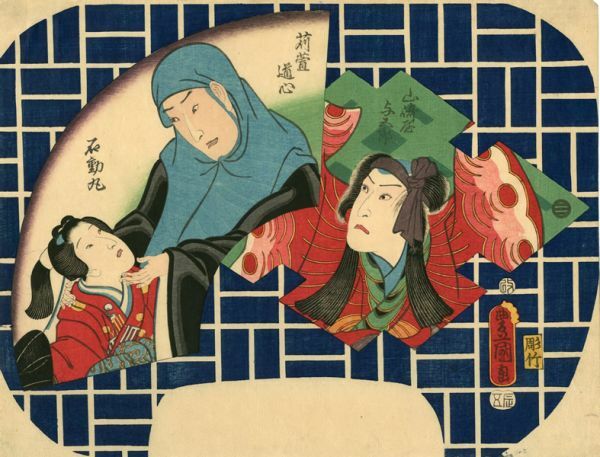 From the play Meiyo jinzeiroku performed at the Ichimura-za in 1852. Oban diptych. Fine, early impression. Brilliant unfaded colour. Pristine condition. 1857. Oban. Fine early impression with strong wood grain and burnishing on deluxe paper. Fine colour and condition. 1893. Oban. Fine impression, colour and condition. 1894. Fine, early impression with the background extensively embossed. Fine colour and condition. 1852. Oban. Fine impression, colour and condition. 1859. Oban. Extremely fine, early impression on thick, deluxe paper. Brilliant colour. Fine condition. 1859. Oban. Extremely fine, early impression on thick, deluxe paper. Fine colour and condition. 1893. Oban. Fine, early impression of the delux edition on thick, heavy paper with extensive metallic printing and mica. Fine colour. Fine condition with extremely large margins. 1849. Chuban diptych. Fine impression with extensive embossing. Very good colour and condition. Album backing. 1775. Hosoban. 31.2 x 14.3cm. Fine impression. Very good colour and condition. 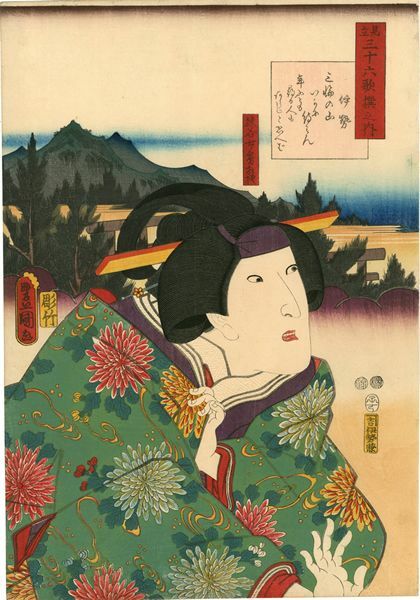 The right-hand sheet of a diptych, whose left-hand sheet shows Yoshizawa Iroha I as Senzai. An impression of the complete diptych is in Boston. 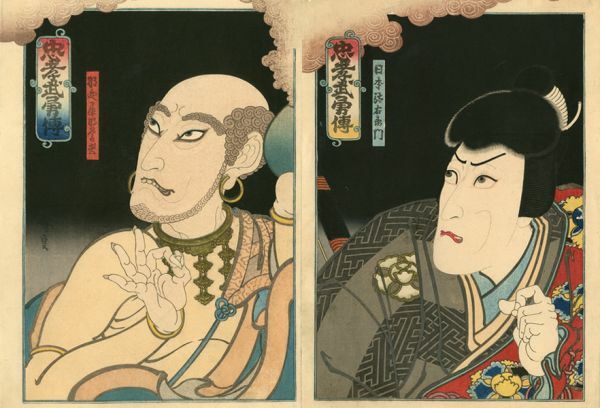 This particular scene represents a theatrical presentation demonstrating Kaomise performances in Kyoto, from the three cities of Kyoto, Osaka and Edo. Circa 1927. Oban. Fine impression with extensive blind-printing. Fine colour and condition. Early 1830. Oban. Fine impression, colour and condition.